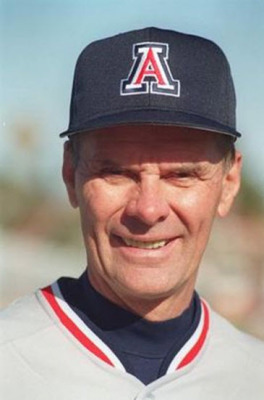 Longtime Tucsonan and former University of Arizona baseball coach Jerry Kindall has been chosen Grand Marshal of the 2015 Tucson Rodeo Parade. Kindall is a former player, coach, teacher, author, and baseball broadcaster. He played basketball and baseball at the University of Minnesota. In 1956 Kindall was an All-American member of the Gophers baseball team that won the College World Series Championship, ironically defeating Arizona, a team he would later lead to three NCAA championships. He spent eight years as an infielder in the Major Leagues with the Chicago Cubs, Cleveland Indians and Minnesota Twins. He coached as an assistant at Minnesota until 1972 when he became head coach at Arizona. He led the Wildcats to the College World Series five times and to National Championships in 1976, 1980, and 1986 and was named National Coach of the Year those same years. He remains Arizona’s all-time winningest coach. Coach Kindall has been inducted into the University of Minnesota, University of Arizona, and the College Baseball Coaches’ Halls of Fame. Since his retirement, Kindall has kept involved with the game he loves as a Senior Advisor with USA Baseball, giving instructional clinics and coaching internationally, and broadcasting baseball for ESPN and Fox Sports. He has authored one book and four videos on baseball coaching and instruction, and served as editor of The Science of Baseball and The Baseball Coaching Bible. The Jerry Kindall Character in Coaching Award is presented annually by the Fellowship of Christian Athletes to the college or high school baseball coach that best exemplifies the Christian principles of character, integrity, excellence, teamwork and service on and off the baseball field. He remains involved in the Fellowship of Christian Athletes, Ministry of Young Life, and is an elder at Catalina Foothills Presbyterian Church. The Tucson Rodeo Parade Committee typically honors individuals as its Grand Marshal. This year the Parade Committee is honoring a Tucson institution. The Tucson Arizona Boys Chorus will lead the 2012 Tucson Rodeo Parade. The Boys Chorus exemplifies the tradition, culture, and southwest heritage that are epitomized in the Rodeo Parade. They have always included western songs such as “Ghost Riders in the Sky” “Cool Water” and “Ragtime Cowboy Joe” in their repertoire. The Boys Chorus was founded in 1939 by Eduardo Caso, a nationally known tenor who moved to Tucson to recuperate from tuberculosis. Caso took the boys on tours, introducing them to national audiences at the 1950 Chicago World’s Fair and on television programs such as the Bell Telephone Hour, the Ed Sullivan Show, and the Mike Douglas Show. They became international stars on tours of Europe in 1955, and Australia in 1960. In 1963 they sang at the White House at the annual Christmas treelighting ceremony. They are truly Tucson’s “Ambassadors in Blue Jeans.” The Chorus has had only four Directors in its 72 year history. Caso continued as director until his sudden death in 1965. Jeffrey Haskell, a University of Arizona doctoral student stepped in and served as Director for the next 10 years. In 1975 Dr. John Davis, a former soprano for the Boys Chorus, was named Director and continued the Chorus’ tradition of touring and community representation. The Chorus’ current Director, Dr. Julian Ackerley took charge in 1980 and took the boys to tour the Soviet Union, Germany, Austria and Poland to celebrate their 50th anniversary in 1990. They continue to tour nationally and internationally to locales such as Mexico, New Zealand, China, Southeast Asia, Europe, and South Africa. They have represented the United States at international choral gatherings in South Korea, Hong Kong, and the Czech Republic and have performed at several American Choral Director’s Association Conferences, AmericaFests singing festivals, the World Symposium on Choral Music, the International Children’s Choir Festival, the Macy’s Thanksgiving Day Parade, and with the Mormon Tabernacle Choir. In 1996 the Boys Chorus received the Governor’s Arts Award for Arts in Education acknowledging their artistic excellence as well as their aggressive community outreach program. The boys are also recording stars, recording their first album in 1959. They have recorded numerous albums featuring American popular music, Western ballads, patriotic favorites, Christmas and Hanukkah standards, and religious and spiritual classics. The Boys Chorus has passed along the principles of discipline, responsibility, commitment, and hard work to thousands of young men. The Tucson Rodeo Parade is proud to have the Tucson Arizona Boys Chorus as its 2012 Grand Marshal. Joel D. Valdez currently serves as a special adviser to President Robert N. Shelton of the UA Foundation, offering guidance on the University’s growth and development and the UA’s role in the city’s Modern Streetcar Project, the future expansion of the Marriot University Park Hotel, the potential redevelopment of the northwest corner of Speedway and Campbell and much more. Prior his position with the Foundation, Valdez spent 20 years at the University of Arizona as senior vice president for business affairs where he served under four university presidents in his two decades on the job and implemented more than $1 billion worth of construction projects that have changed the face of the campus. Valdez’s work with the University followed a long successful career in Tucson city politics. From 1974 until 1990, he was appointed Tucson City Manager, during which time he oversaw 4,000 employees and administered hundreds of millions of dollars in capital improvements in many areas, including housing, water and sewer, public safety, libraries and various private ventures. Throughout his life, Valdez’ sphere of influence as extended far and wide in Tucson. Constantly active in his community, Valdez dedicated much of his free time to help others, where he has served on the boards of the Mariachi Conference (for which he is also a co-founder), Hellenic Cultural Foundation, United Way and the Diocese of Tucson, where he has been named a Knight of the Holy Sepulchre. He received a BS in education from UA in 1957, a Certificate from the Sloan School of Management, M.I.T in 1972 and a diploma fro Harvard University’s Senior Managers in Government school in 1978. Valdez, a Tucson native, and his wife Mary Lee have two children and five grandchildren. James “Big Jim” Griffith as its 2010 Grand Marshal. Teacher, founder, anthropologist, author, story teller, award-winning musician, and folklorist all describe the 2010 Tucson Rodeo Parade Grand Marshal, James “Big Jim” Griffith. For over four decades Big Jim has studied folkways and religious expression throughout the United States-Mexico border region. Griffith’s work as an academic and public folklorist has been extraordinary and his legacy includes founding the Southwest Folklore Center at the University of Arizona and the annual Tucson Meet Yourself Folk Arts Festival. He received all three of his degrees from the University of Arizona, the Ph.D. in cultural anthropology and art history in 1973. From 1979 until his retirement in 1998 he ran the University’s Southwest Folklore Center. He is currently a Research Associate at the Center. With his wife, Loma, he started Tucson Meet Yourself in 1974. The celebration of Tucson’s ethnic and cultural diversity now draws over 100,000 participants annually. Although he retired as director of the festival in 1995, he is once again heavily involved in this project. Starting in 1985, he wrote and hosted “Southern Arizona Traditions,” a weekly 3-minute spot on KUAT-TV’s Arizona Illustrated program. For 2 ½ years in the late 1980s he wrote a monthly column on “Local Custom” for the now-defunct City Magazine. He was curator for eleven exhibitions of regional traditional arts, the most recent being “La Cadena Que No Se Corta/The Unbroken Chain: The Traditional Arts of Tucson’s Mexican American Community,” at the University of Arizona Museum of Art in the winter of 1996-7. Griffith has written seven books on Southern Arizona and Northern Mexico folk arts, traditions and religious art. He has been honored by several literary societies and includes such awards as the 2005 Henry Glassie Award and the 2009 Pima County Library Lifetime Achievement Award. He is currently researching for a book on the religious art of Sonora, and finishing a guide to regional folklore. Jim Griffith’s professional commitment has always been to try to understand the cultures of this part of the border, and to pass along that understanding, as respectfully and accurately as possible, to the general public. His commitment to the history and culture of the Southwest make Big Jim a natural selection as Grand Marshal. Cele Peterson is with absolute certainty, one of the most outstanding members of Tucson. She has been a member of the business community for over 70 years and has received several awards for her success. Her undying devotion to countless civic organizations and philanthropic affairs is an inspiration to us all.